In the midst of closing parties and the usual end of season madness there is also a sense that the island is switching gears, preparing itself for its quiet more grounded winter rhythm. As islanders we look forward to coming back to the white islands spirit of wellness and what better preparation than to attend this upcoming Ibiza Spirit Festival on October 1st in the idyllic setting of Atzaro’s “agroturismo” up North. Key founder and organizer of the event, Jerry Brownstein, conceived the festival as an opportunity for us to “harness the power of positive transformation” and “come together as one”. 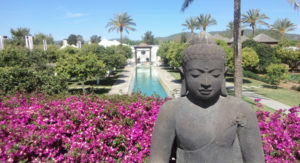 By highlighting the wealth of alternative lifestyles on the island, its incredible mix of international people and what is largely seen as the “freedom to be yourself”, the festival puts Ibiza on the map as having the potential to create “a new story for humanity”. Soulful music and creative dance will transport you into this greater spiritual dimension. Drumming beats, singing circles, dj’s, healing quartz bowl vibrations, trance, bellydancing will all help tune you into your innate wisdom. 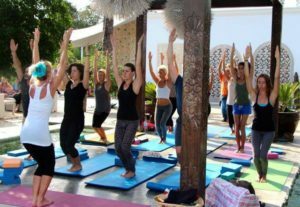 There will be an abundance of yoga therapies and classes, breathing and stretching workshops and meditations to help you reactivate your inner joy. You can relax in the chill out space and if you are feeling like a more personal touch there will be massage therapists, reflexology, reiki, cranio-sacral and oracle readers to assist your intuitive self. Look forward to some inspirational talks guiding you to recalibrate your daily routines and rituals. One of the key speakers, Gopi Kallayil, the Chief Evangelist for Brand Marketing at Google and the man who brought yoga and mindfulness practices to Silicon Valley, will talk about his new book, “The Internet to Inner-Net” and highlight how to access your inner and outer technologies in daily life. With 50 different events being hosted, countless colorful stalls, delicious food readily available and a magical children’s garden section filled with face painting, puppet shows and storytelling, it is a festival well worth checking out. All proceeds from the event will go to support local charities like APNEEF (a special needs children association).